But that’s Berlin Atonal Festival in a nutshell. It’s what Tresor entrepreneur Dimitri Hegemann calls “a platform for radical ways in electronic music … in an industrial cathedral,” a packed-solid schedule of music and media art in the hulking abandoned shell of the power plant above the techno club. And now, Atonal is at an interesting inflection point. While the festival had its roots in the former West Berlin, 1982-90, it got a fairly significant reboot after a 13-year hiatus. So, sure, Hegemann himself carried over from the festival he first started. But a new curatorial team, a new context, this whole, uh, computer thing that happened, the reunification of Germany, the transformation of Berlin into international capital, the explosion of techno – these are non-trivial changes. That’s to say nothing of the move from a fairly conventional club (SO36) to a DDR-constructed behemoth that is literally used to record reverb impulse responses. 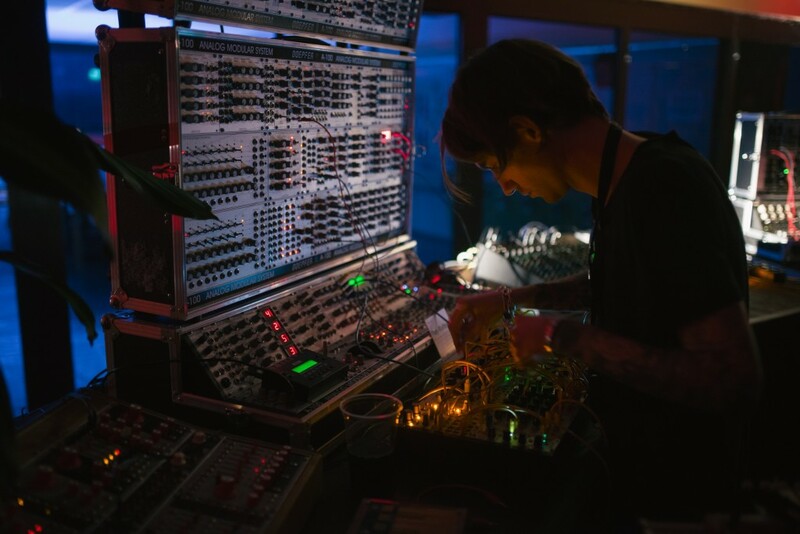 And the festival that once hosted the likes of Einstürzende Neubauten now treats listeners to a brand of experimental music that, while still adventurous, is starting to become commonplace in the festival circuit. But maybe that’s the state of “radical” electronic music in general, certainly in Europe and the islands of media art chic around the globe. A fifth year festival isn’t going to be a shock that the first-year one is. But more than that, there’s a brand of violently sensory, retina- and eardrum-blasting but intelligent and high-concept experimental festival fare. And it’s grown popular. That popularity also transforms at least a circle of people making it. Their sound may be distorted and aggressive, but now it’s out of the tiny basements and blown-out crap PAs, and onto expensive speaker arrays, surround sound. There are sound technicians, even. I’m of the opinion this doesn’t make experimental sound less experimental – on the contrary, it ups the acoustic and optical firepower and precision available to artists, which gives them a wider spectrum to exploit. It inarguably makes it less underground, but it also need not destroy underground aesthetics – and I think artists being able to eat is a good thing. Of course, the future is already here, it’s just not very evenly distributed yet. So I’ve watched curators cherry-pick their favorite acts from past Atonal, then import them to their own festival the following year. But that’s in something of a bubble, centering around Berlin (and London, and Amsterdam, and other capitals) in Europe, and festivals like MUTEK in the Americas (now a kind of pan-American festival franchise, in fact). It’s to the point where I can’t recall which festival discovered whom. That consistency is easy to criticize, particularly for anyone jealous of Atonal’s grand spectacle (as a curator), cool crowds (as an audience member), or artist opportunities (for music and media art makers). But on the other hand, for this circle, it can begin to allow refinement. Audiovisual works in particular benefit from repetition and iteration, as you rely on multiple media to mature in parallel, collaborations to deepen. And a certain oneupmanship among lineups can drive artists to hone their craft. This leaves us the question, what makes Atonal special? Well, the obvious edge is its space. The artists interviewed aren’t kidding: you can’t imagine how big Kraftwerk is until you enter. It’s bigger than cameras can capture, vaster than words can convey. The Atonal organizers have found a way to tune the experience for listeners center stage, amazingly stopping it from turning into mud. And artists are adjusting their sets, too. But I agree with Sam Kerridge – it’s a unique pleasure to wander the space. Festivals are so often a pre-packaged, linear experience, a proscenium blasting a pre-determined significance to a packed crowd. In Kraftwerk, you can explore a set the way you would an art museum after closing. You can stand under the stage. You can find a sweet spot by a wall where reflections transform your perspective. You can find yourself gazing in complete stillness at some installation. And Atonal combines this with Ohm (the former battery room of the power plant, an intimate tile-walled affair) and Tresor (the basement, with its famous metal-bar booth). That says something about Berlin as it is now, citywide, year-round. It’s too much music, and it’s dark and industrial and sometimes monotonous. But you’re free in that overabundance to chart your own way, to come and go in a music culture that seems to have no beginning, middle, or end. Back to experimental music’s roots. I always have a historical bias, so this is what I’m excited about. For both Atonal and The Long Now (two Kraftwerk-based festivals sharing some of the same curators), attendees are treated to a mix of historical concert music / new music / historical works and new commissions. In this year’s Atonal, it’s Stockhausen‘s turn. His 8-channel spatial OKTOPHONIE is inspired by the sounds of warfare (a tradition itself with threads back to Italian futurists). Stockhausen collaborator and director of the Stockhausen Foundation for Music, Kathinka Pasveer, leads that recreation, and younger composers will try out the system, too. Rashad Becker + Ena on those eight channels should be especially good. But it’s nice to be treated to Karlheinz, too – having heard Cage and Reich recalled in this space, I can’t wait. New stuff. There’s too much here to mention, but it’s fair to say this year’s Atonal promises more emerging artists and premieres, and might be one of the breakthrough festivals in 2017 generally. I’m curious about the “composed live act” of Chinese performance artist and composer Pan Daijing, the collaboration of Renick Bell (live coder) and Fis (sound designer). Sophie Schnell (PYUR) I’ve followed since her first AV show, and she has a unique and sensitive approach to her solo audiovisual work – this seems one to watch. Turkish-born Nene Hatun has a Rumi-inspired work. I’m keen to see LCC (Ana Quiroga and Uge Pañeda) plus Pedro Maia; these Editions Mego-recorded artists are at the top of their synth game, and it’ll be spectacular to see them on this grander scale. One sure-to-be-poingnant moment is Argentine-born installation artist, instrument builder and clarinetist Lucio Capace, who will have a trio doing a remembrance of the late experimental legend Mika Vainio. All stars. Okay, and there’s more Puce Mary, more Roly Porter, more Shackleton, more Emptyset, etc. etc.. But with new premieres and such from these artists, there’s a reason to bring the all-star quasi-residents back. Some possible highlights – the combination of Shackleton’s music, Anika‘s voice over, Berlin artist Strawalde, and live visualist Pedro Maia is on my must-see list – partly because that combination sounds like it’ll either be transcendent or a cluttered mess, and that uncertainty ought to be why we go see stuff. 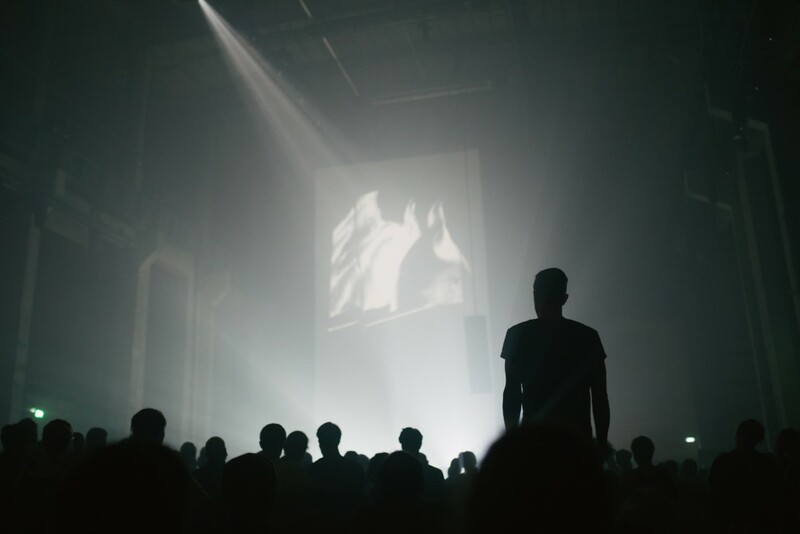 Emptyset is doing something with architecture – and architecture is what Kraftwerk is about. We’re Northern Electronics fans around these parts, so a program by the label’s Jonas Rönnberg aka Varg is a must on Sunday. I’m skipping the DJ lineup, but it’s also really robust. Can’t fly to Berlin? (or, uh, walk across the river as you don’t work for Ableton or Native Instruments?) Fret not. The Wire has a special, free download of a number of wonderful live recordings from 2014, 2015, and 2016. And, okay, basically these are all favorites here – note Peder Mannerfelt, PYUR, Ena, and so on returning in 2017.